Planning for the funeral usually involves an emotional and costly process. The things needed to prepare for the funeral service and interment can become overwhelming without some proper guidance. Hence, you must start arranging for the funeral ahead of time. However, many people tend to shy away from this difficult conversation. In order for people to outline the logistics, services, or goods that are often included in a funeral or memorial services, a funeral checklist is needed. The checklist must include a complete list of all the necessary things to do and to buy for the funeral. Many of the items in a checklist can be pre-arranged and paid prior to death, but other items cannot be arranged beforehand and can only be identified following the death of a loved one. 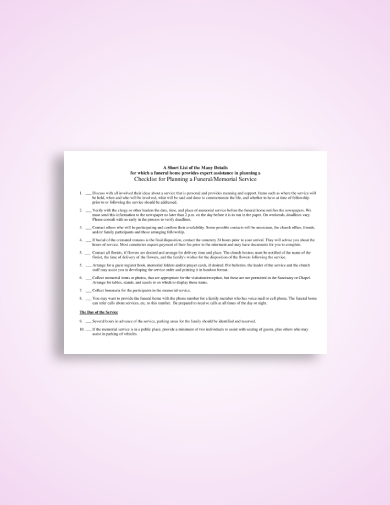 In this article, provided are the different variations and examples of funeral checklists. Note that when the deceased has a prepaid funeral arrangement, you must locate and contact the funeral home he or she worked with. Doing the funeral arrangement is an overwhelming and stressful task. The person in charge may still be grieving or may not have a clear understanding of the wishes of the deceased but still need to work on planning for the funeral service and interment. 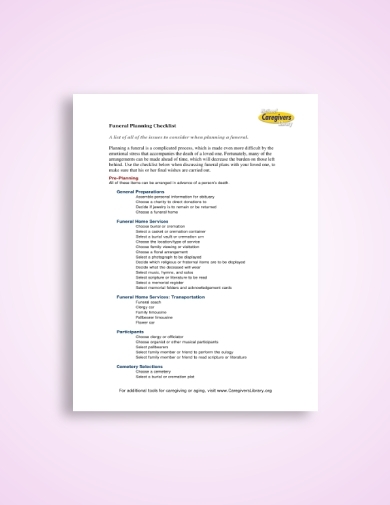 To help the mourning family overcome the stress, this funeral and memorial service checklist example may provide assistance for planning the service and luncheon by presenting the items that are necessary for the funeral program. In this checklist, several guide questions are asked in order to help you get through this painful process of funeral planning. Losing a friend or family member can greatly disrupt your emotional stability. When this sorrowful event comes and you need to be responsible in planning for the funeral, things can become very overwhelming. There are many decisions you need to make such as where to hold the service, whether to have a traditional funeral or the modern one, which funeral home to choose, and a lot more. 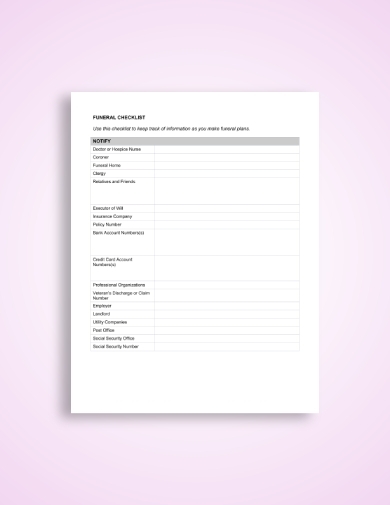 Because you have a lot of things to consider in a funeral arrangement, you need a checklist to guide you by providing you a list of all the details of a memorial service, just like this generic funeral checklist. This can surely help you remember all the things you need to prepare so you would not miss anything. With the use of a checklist, you will stay organized and you can easily remember all the critical details when planning a funeral. In this checklist for planning a funeral program and memorial service example, you will be provided a step-by-step guidance on what to do and what do you need to prepare. This is applicable whether you are pre-planning your own funeral or you are planning the funeral of a loved one. It enumerates the things you need to do and prepare the day before the service, the day of the service, and the day following the service. This can truly provide you the guidance that you need in this mournful time of your life. With the many responsibilities that you need to care of while you are still grieving, you will certainly be caught off guard. Those who have planned a funeral before may even have the tendency to get overwhelmed by the arrangements they need to make, and even those with prearranged funerals still need to be organized as there are some things needed to be prepared that can only be seen after someone’s death. 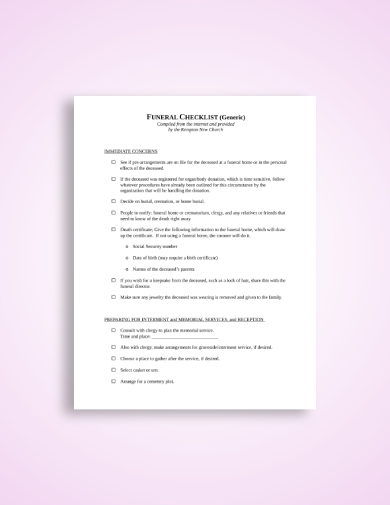 Hence, to have a list of the complete tasks that you need to arrange for the memorial program or service, you need to have a funeral checklist, just like the simple funeral checklist example presented above. A funeral can be big to organize, second to a wedding, as the funeral needs to happen within just a few weeks. When this time comes, the family members are all in the stages of bereavement and not in the best state of mind to plan for the funeral arrangements. 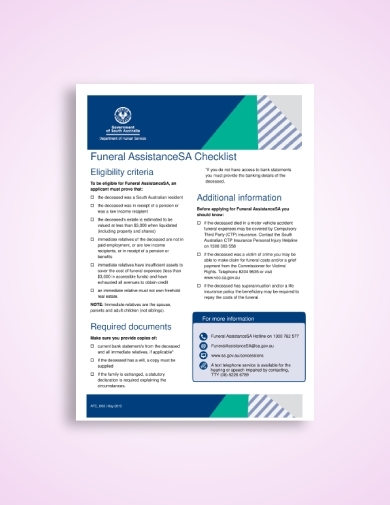 Hence, to help the family stay sane, this funeral assistance checklist provides guidance for the surviving family members so they will be guided in doing the funeral preparations from the day before the funeral and after the interment. Keep all the important information related to the funeral arrangement in one place by referring to this funeral planning checklist. It contains a list of all the issues you need to consider, such as the following: general preparations, funeral home services, transportation, death notice, participants, funeral invitations, cemetery sections, death certificates, burial permit, and a lot more things that are related to the funeral. So whether you are arranging a funeral for a departed loved one or for yourself, make sure that you use a checklist to outline the items you need to prepare and process for the funeral. Lastly, do not forget to refer to the funeral checklist examples presented above so you will be guided in creating your own funeral checklist.